Home BLOG Project Management Blog How to Become a Project Manager ? How to become a project manager ? Many professionals working in the field of project management ask this famous question to us. Therefore we decided to write this article to provide a guide for the professional to grow up their project management career path. Actually it is difficult to determine what you should study, what type of experience you need and how to select the industry. Many types of companies employ project managers to manage projects from construction to healthcare. Typically, a PM is responsible for keeping projects on track and organized to meet the organizational goals. Before to start, let’s discuss what a project manager does ? Who is a Project Manager and What Does a Project Manager Do ? Basically the role “project manager” is a popular role among professionals. However do you know who is a project manager and what is the responsibility of him/her ? Simply put, a PM is someone who has the entire responsibility for the successful performance and completion of a project. He has the overall responsibility to manage design, initiation, planning,execution, monitoring and controlling and close up processes within a project. From this aspect, a PM is responsible of both the success and the failure of the project. A PM spends most of his time with managing people, communication and collaboration. A PM’ s daily routine includes writing several e mails to various people, reviewing reports, communicating with the client’s representatives, assisting team members and participating in meetings. In order to become a project manager, you need to have some basic skills such as technical, managent and organization. A project manager is the one who can develop strategies to reach the project goals. He deals with people, issues, systems, processes as well as resources. Therefore a project manager need a wide range of skills to perform the project. Considering today’s challenging projects, a project manager must be able to work under pressure and manage several individuals participating in a project. Note that you must have enough knowledge on project management processes and knowledge areas as well as project management methodologies suc as Waterfall, Scrum, Kanban etc. Most of the project managers have at least a bachelor degree in the field of their businesses. Except for exceptions, if you want to become a project manager in the construction industry, it will be better for you to be a civil engineer. The same goes for other industries. 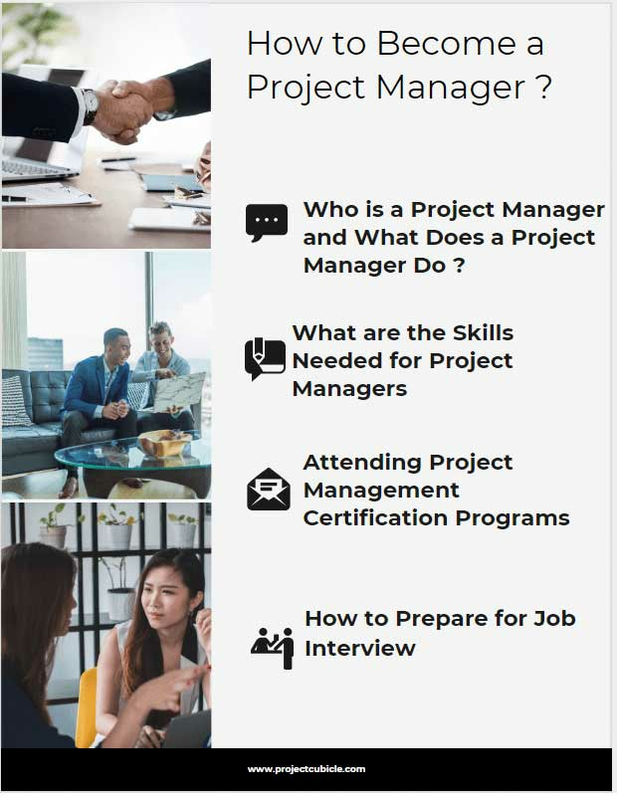 In other words, obtaining a bachelor’s degree in a specific area such as marketing, engineering or IT, depending on what type of industry you would like to work, will help you to become a project manager. You can participate in master programs or project management or organizational management programs that many universities provide. After getting the bachelor’s degree, you can improve your knowledge in the field of project management by participating in certification programs. If you don’t have time to attend a course, you can try online courses, webinars and trainin programs. There are many programs available for project managers to improve their knowledge and network. Obtaining a project management certification provides many benefits to the professionals such as increased salary, having better job opportunities and working in better projects. Getting certified will help you to hold a Junior or Associate PM position at the beginning. Companies prefer certified project managers rather than non-certified ones for large and sophisticated projects. However, in order to become a certified professional, you need to meet specific eligibility and experience requirements along with passing a written exam. Below are some of the best certification programs currently available. Note that certifications are not mandatory to become a PM. However, globaly acknowledged certifications confirm your knowledge and provides greater visibility to recruiters. Hiring an effective PM is vital for the future of any organization. Therefore, HR Managers and executives test the knowledge and experience of an applicant during the interview. They often ask your current and previous work experiences to understand if you are suitable for the job or not. Most of the questions that they may ask are related with project manager skills and competencies. We recommend you to read this article regarding to PM Interview Questions and Answers. Many professionals seek the ways of building a career as a PM. However many of them don’t know where to start. This article provides you a guide to help you to become a project management professional. In brief, if you want to become a PM, you should possess some technical and management skills as well as being well educated. Becoming a PM may be good carrier for you. Could you please share your knowledge on how to become a Project Manager ? We would like to hear from you about your path to become a project manager.